A small specialist in shopfitting which manufacturers high-quality products, already had a wide belt sanding machine for the regular sanding. However, this machine was not apt for denibbing. 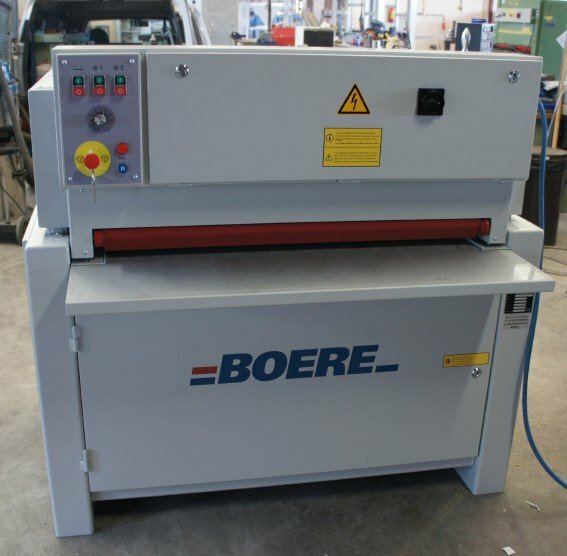 Based on the Sandrite model, the type of machine which the client has, Boere developed this sander further for very high quality denibbing. The machine has been equipped with two segmented sanding pads (integrated in the socalled combi unit: contact roller + sanding pad) and is operated through a user-friendly touch screen. By using two segmented sanding pads in just one pass a high finish can be obtained. Of course it remains possible to calibrate by using the two contact rollers. Thus a multi-purpose machine!